Let me think for a second; is it the blue or the red wire? Is it the plus or minus sign? The bomb will explode. If I act now, maybe there is still hope. 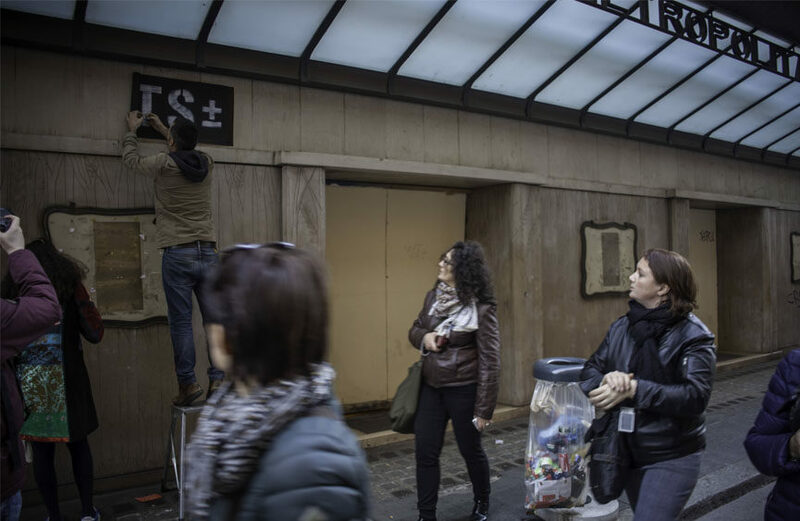 ±MAISMENOS± is in Rome and he is dusting off the lint from the iconic and shut-down cinema buildings. The call to arms, ±MAISMENOS± and Forgotten Project shout out. The Eternal city answers back and offers the recently closed doors of many cinemas in hope that the powerful idea of what Rome is and was will not be forgotten. That the marvelous past of iconic buildings, of the black and white made in cinema, still embodied in the urban space, is resilient and will not leave its lovers and warriors behind. 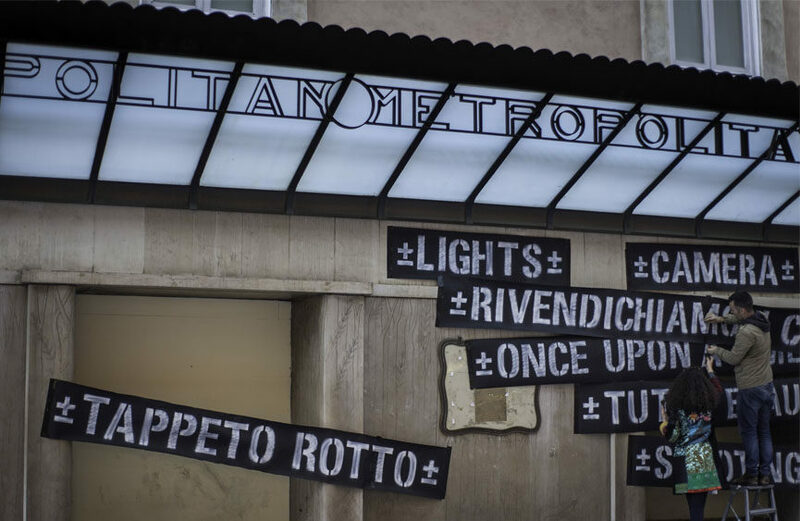 Recently over 40 cinemas in Rome closed theirs doors due to the urban changes and Forgotten Project, with its invited artists, give spotlight to the buildings that are at risk of being forgotten. MaisMenos detail of street installation, Metropolitan Cinema, Via del Corso, Rome. 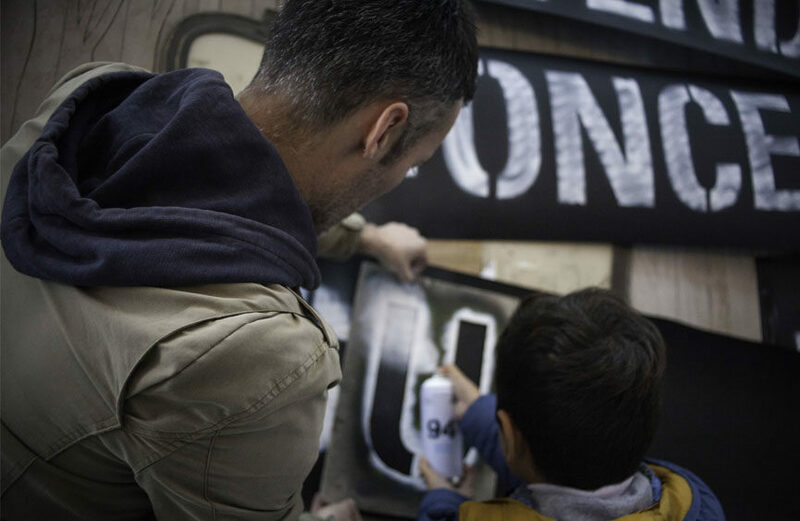 Going out to the street and doing something is a political act to the Portuguese artist, Miguel Januário, creator of the political and thought-provoking project ±MAISMENOS±. The project presented itself as a brand against brands in 2005. 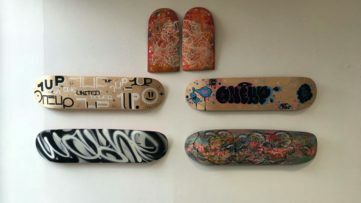 The socially aware graffiti, street performances as well as indoor art exhibitions, act as blank canvases, an open-ended icon, where the public can project anything they fear or wish. 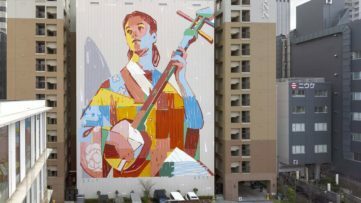 That is the power of street art that the artist believes in, its ability to give information that the mainstream media may not be able or wish to give us. 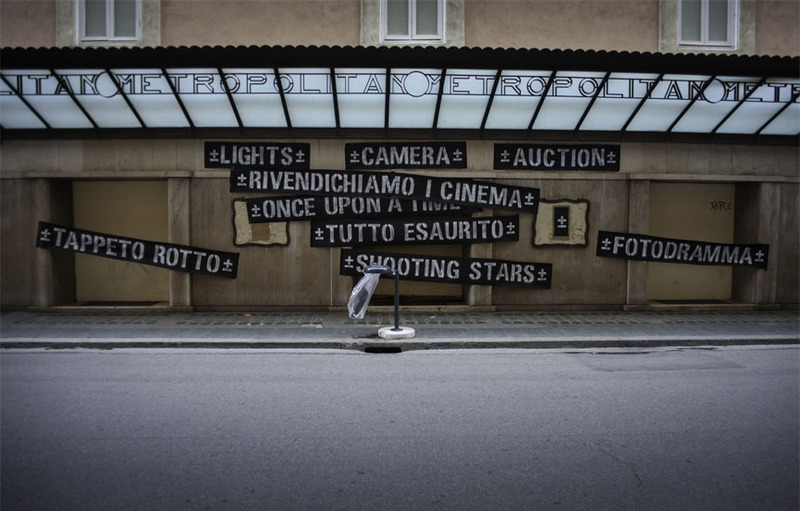 Details of the street installation by ±MAISMENOS± at Metropolitan cinema, Via del Corso, Rome. The text is simple but the message is powerful. The play off words, minimalistic approach and the investigation of typography is crucial to the work of ±MAISMENOS±. 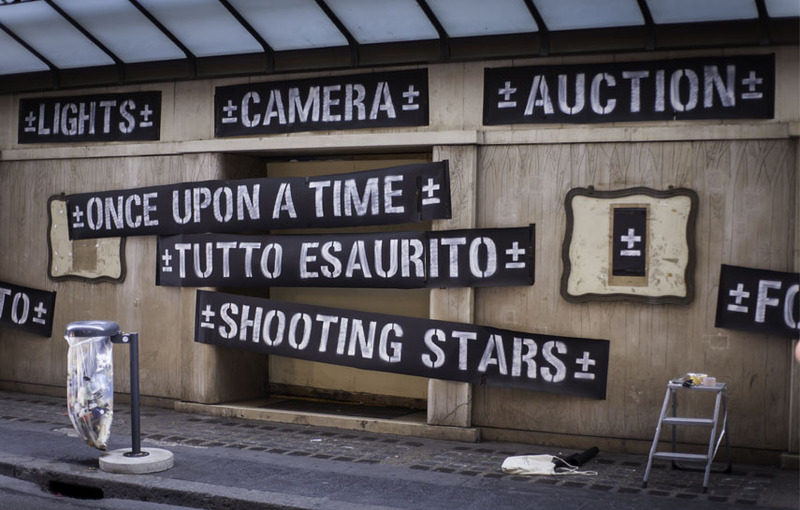 This time, in front of the Metropolitan cinema at Via del Corso, the artistic street installation Lights Cinema Auction with the help of the passers by was created.Stencils cut out, spray in hand the artist created words that reference cinema language and resemble cinema seals. The words, almost like part of an association game, touch and scream at the same time. They are timeless, but ambiguously stuck in the middle. 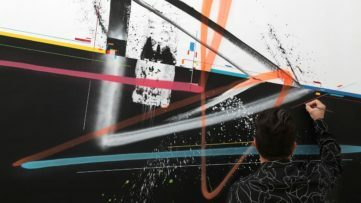 From that middle, from that wall, like so many of the previous works of the artist, they call for action and for change. 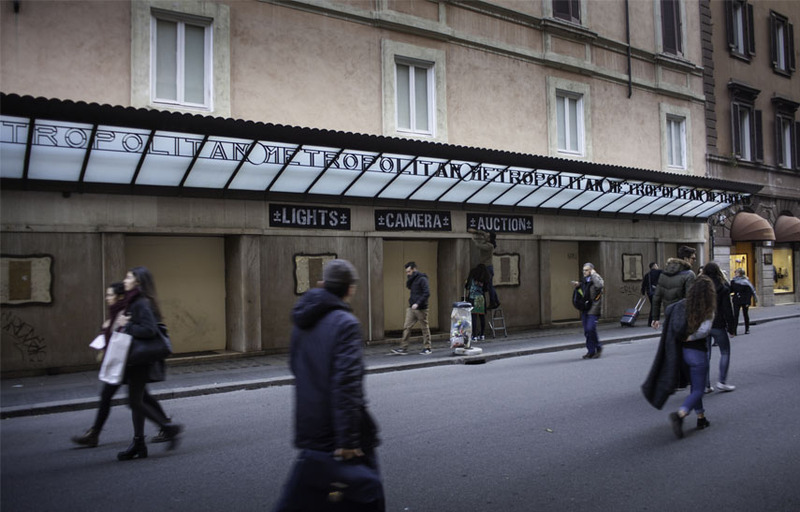 MaisMenos, wide view of the street installation, Metropolitan cinema, Via del Corso, Rome. 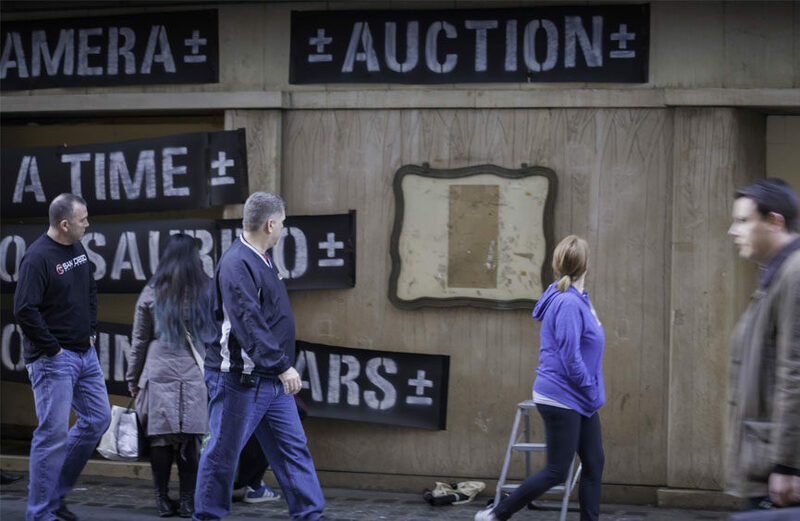 Invited by the Forgotten Project, ±MAISMENOS± is the fourth participating artist that is engaged in trying to pay an homage to some buildings that have, for reasons mainly linked to the change of time, been closed down or are on a verge of being forgotten. 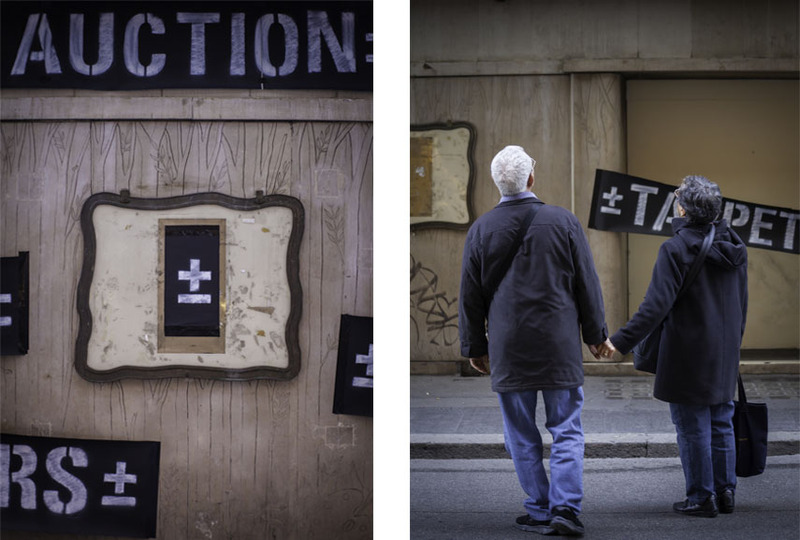 He has been in Rome since 19th February and has organized street installations based on playing with typographic characters. After having focused on the old factories, little stations and dismissed areas of the city, urban project Forgotten is now paying homage to former cinema buildings. As usual Forgotten Project proposed and carried out a parallel activity to the artist’s intervention and this time it was a treasure hunt game organized on the eve of 20th February. The project is already halfway through and will culminate with an exhibition at MACRO- Rome’s Contemporary Art Museum – later this year. Participating artists and the organizers of the project aim to highlight what soon may disappear not just from view but also from the code of this marvelous and historically important city. All images courtasy of Paolo Darra and the Forgotten Project.